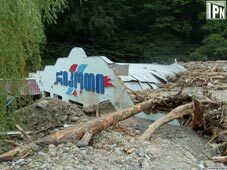 GEL 14 million will be needed to rectify the damage inflicted by recent heavy flooding across Georgia – a statement concerning the issue was made by the Minister of Regional Development and Infrastructure, Ramaz Nikolaishvili, on June 21, at a Government sitting. “The GEL 10 million, which was earmarked for addressing the damage, will be increased by a further GEL 4 million. However, no more than GEL 14 million would be required,” the Minister stated and mentioned that the road department has already ceased its projects and currently is only concentrating on the restoration of the infrastructure affected by the element. As Nikolaishvili stated, intensive rehabilitation works are underway on Rikoti Pass section of the main highway connecting Eastern and Western Regions of Georgia. He hopes the traffic will be fully resumed on this section of the highway in a few days. Movement in the Rikoti Tunnel is only partly allowed - only trucks are allowed to pass through it from the west to the east, while movement from the east to the west is only allowed from the Sachkhere-Akhaltsikhe diversion.